The first plot shows the aerosol extensive property of light absorption for nominally “red,” “green,” and “blue” light over a two-week period at Ascension Island. The second plot shows the wavelength dependence of aerosol absorption—an intensive property—which describes the nature rather than the abundance of the absorption. The Aerosol Optical Properties (AOP) value-added product (VAP) is now available, featuring fully corrected aerosol scattering and absorption measurements from all ARM Aerosol Observing System (AOS) deployments within the past two years. The AOP 1-minute VAP provides 60-second averages of a fully corrected set of aerosol extensive properties—scattering and absorption—with consistent intensive properties (angstrom exponents, asymmetry parameter, single-scattering albedo) at a uniform temporal grid. These properties are critical for aerosol direct radiative forcing and indirect forcing studies, and for radiation closure. This VAP was developed for AOS deployments at all ARM observatories, including the Southern Great Plains (SGP), Eastern North Atlantic (ENA), and North Slope of Alaska (NSA). It succeeds the Aerosol Intensive Properties (AIP) VAP, which produced results only for AOSs deployed before 2011. The AOP VAP extends on the single-wavelength AIP VAP by providing more comprehensive quality assessment. It provides corrected absorption at three wavelengths instead of one, implements corrections published since 2010 over the previous algorithms published in the 1990s, and eliminates instrument artifacts identified in the past two years. The current released product applies to scattering measurements from the 3-wavelength nephelometer and to absorption measurements from the single-wavelength particle soot absorption photometer (PSAP), 3-wavelength PSAP, and 3-wavelength continuous light absorption photometer. It will be extended to processing of absorption from the tricolor absorption photometer (TAP), extinction from the single- and 3-wavelength cavity attenuated phase shift (CAPS) monitors, and absorption from the 7-wavelength aethalometer. 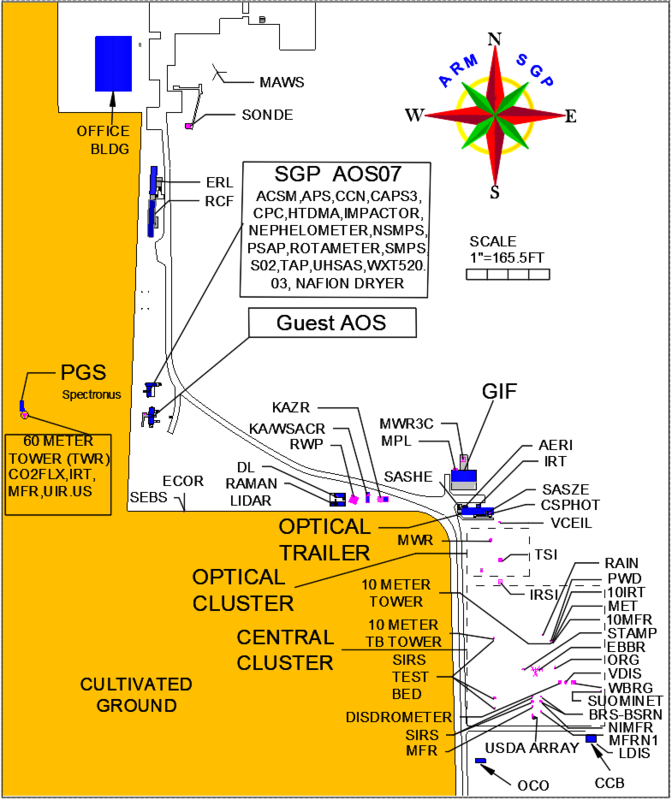 This process is being released for routine next-day generation of products at SGP C1 and E13, ENA, and NSA, as well as mobile deployments at Oliktok Point, Ascension Island (LASIC deployment), and on the Aurora Australis (MARCUS deployment). Processing at SGP, ENA, NSA, and Oliktok Point is available through 2015. End-to-end processing of older historical data is underway to provide a consistent set of aerosol optical properties at each site. The AOP process will also be extended for processing absorptions from the TAP, extinctions from CAPS instruments, and absorption from the 7-wavelength aethalometer. In addition, an AOP 1-hour VAP will be released with robustly screened hourly averages of the properties included in the 1-minute product, as well as size-discriminated products (submicron fractions, supermicron components) not possible at shorter intervals. AOP data can be referenced as doi:10.5439/1369240. To share your experience using the data or to ask questions, contact Connor Flynn, the lead translator for this VAP.